Game description from the publisher: Based on the epic HBO series, Game of Thrones: The Card Game is a card game in which two players wage war in the fields of Westeros and conspire to crush their opponents at court in King's Landing. Two fixed, fifty-card decks allow players to take control of either House Lannister or House Stark. Each deck includes the show's most recognizable characters and locations, including Eddard Stark, Cersei Lannister, Robert Baratheon, Littlefinger, and Jon Snow. Game of Thrones streamlines the rules of A Game of Thrones: The Card Game , the core set of the living card game series, to make it more accessible to a wider audience. Jäger und Sammler is set in the Stone Age. Every player has control over a tribe of 4 hunter/gatherers. The game consists of two main phases: The summer phase and the winter phase. The aim of the game is to collect as many tiles as possible. 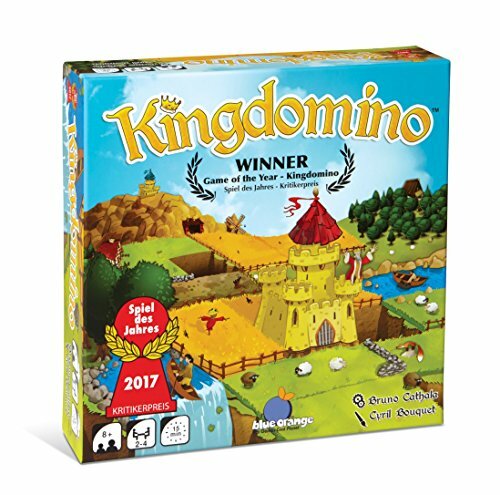 Players have two movement points per turn and are only allowed to move to untaken tiles. When a player leaves a tile he gets to take it and place it in front of him. Food and artifacts are kept face down, but weapons and mammoths are kept face up. Whoever hunts down the biggest mammoth in the summer phase will start the winter phase. Players also have to visit the four winter camps during the summer to store supplies for the upcoming winter. If a player is not able to visit all four camps during summer, he will have fewer hunters in the winter phase. There are a lot of different tiles: - Food tiles score 1 to 3 points at the end of the game, depending on the type of food. - Rare and valuable artifact tiles increase in value depending on the number of identical tiles you collected. - Weapons are used to hunt down mighty mammoths. - Path-tiles remain on the board and guarantee a minimum amount of maneuverability. - Caves are connected with each other and may be used to cover big distances while moving. This game is based on the same prototype as Zombiegeddon. 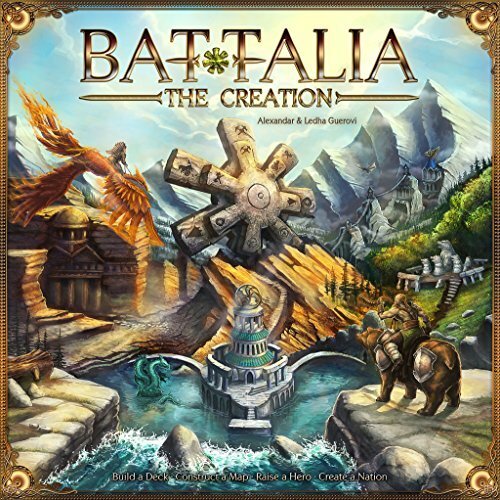 BATTALIA: The Creation is a competitive, fast-paced, strategic deck builder that combines map construction, hero and area control, and unique calendar mechanisms. In BATTALIA: The Stormgates expansion, the players get the following additional functionality: Game material for 2 new players, so the game can be played by up to 6 players. Cooperative Teamplay, which is conducted simultaneously among the team members. The game evolves from strictly competitive to partially cooperative and at the same time from individually turn-based to semi-simultaneous. This new mechanics allows people to build alliances and to experience new strategies, while saving time compared to the standard game duration.The basic mode for 6 players will be 3 teams x 2 players each, or experimental for now 2 teams x 3 players each. The Stormgates allow for easier movement on the bigger map and will add some unpredicted event-bonuses to the players who use them. The new Kings & Queens mechanics will add more power to your deck and is an alternative strategy against the so called "super-slim decks". The new cards will allow you also to build higher level cities - one level 6 capital and two level 5 residences (one summer and one winter residence per player). Heroic mode will be added "officially" in the advanced scenarios section of the rules. In this mode players could use both heroes for simultaneous attacks possibly with increased moral bonus value - from 1 to 4. Two new non-player characters will join the game directly through the expansion box: Bilkarr O'the Mountain people: the old and nice wanderer and herbalist, who could supply you with 6 powerful potion types (Colossus, Weakness, Freezing Touch, Solar Eclipsed, Brotherhood and Berserker), at reasonable price of course :) ... but you have to catch him on his never-ending trail. He knows all the hidden paths and moves constantly through the whole game board in the manner of a "billiard ball" .... Metamorpha: The mighty female Changeling knows certain things about the "Butterfly effect"... She is very sensitive to the natural surroundings and changes her outfit and influence on the players depending on the environment (i.e. terrain card) she stands on. Respectively the players have to expect 6 different situations / bonuses she will provide during the game. She is always attracted to new build terrains (no matter if cities or road cards) and appears magically directly on spot...Metamorpha radiates her influence on the whole map and all heroes standing on the same type of terrain as she does are affected immediately by her magic.